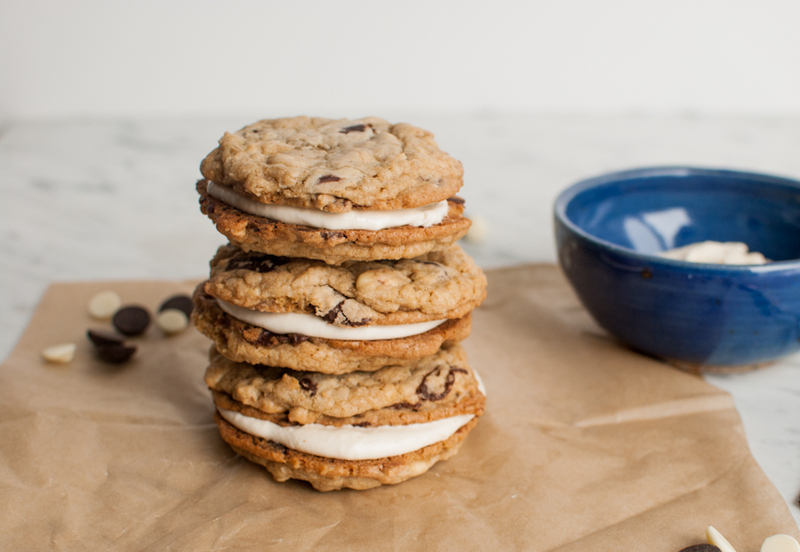 Oh man, the homemade chocolate chip cookie is the best thing ever, hands down, but when you fill it with gooey creamy marshmallow filling….whoooooaaa….look out! Yes it’s very true, homemade chocolate chip cookies are me weakness, in a very BIG way! Don’t give me the hard, fake, bagged cookie found on the grocery store shelf, no way! Only made from scratch, hot from the oven, will do. Recently I experimented with Jacobsen Sea Salt on these, and found myself in pure bliss. I’ve also turned my recipe into a gluten free cookie that is just as yummy as the real thing too! Oh and how can I forget these bad boys I made specifically for my daughter, Nutella filled chocolate chip cookies, also amaaaaazing! 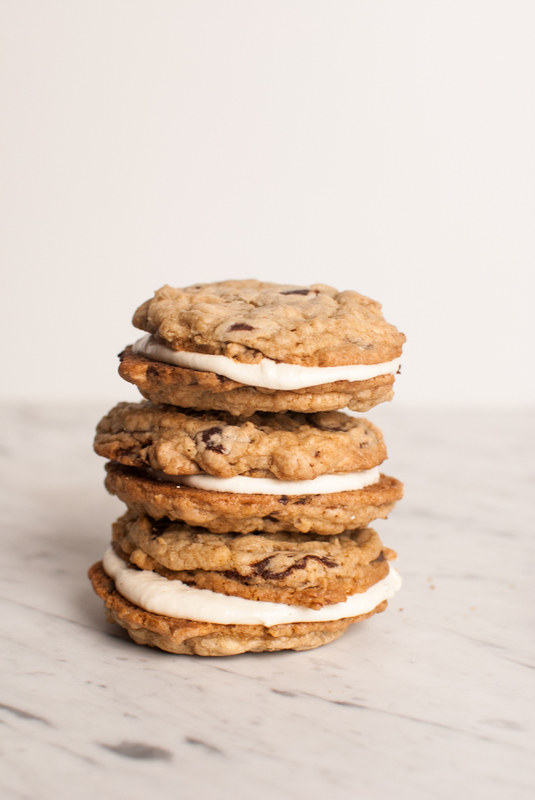 Well, I have one more to add to my chocolate chip cookie craze…filled with marshmallow creme, these are the ultimate sugar fix! 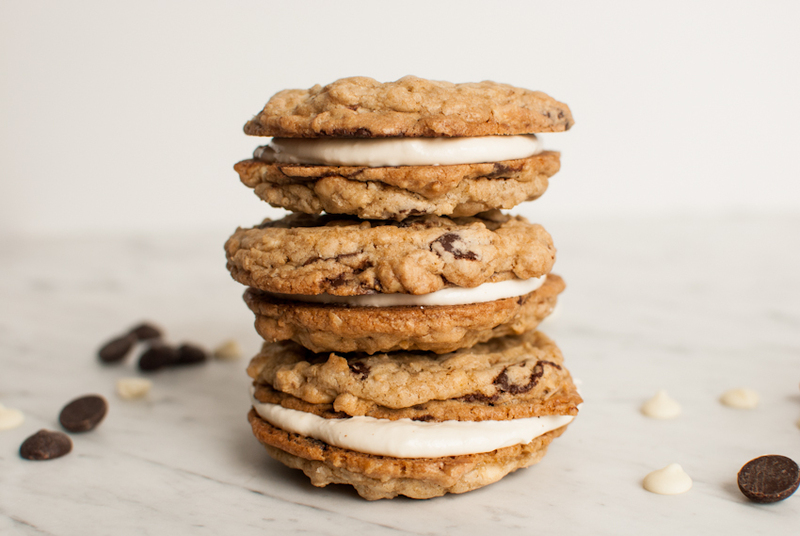 There is just something about the chocolatey cookie sandwich with sweet, gooey, marshmallow cream that will send you into oblivion…um maybe sugar coma is a better word! Seriously, these are so sweet that I could only eat 1! The inner cookie monster in me, had to stop at 1! These are like the little debbie oatmeal cookies you probably grew up on, but 100 times better. I think it’s magic when you combine butter, sugar, eggs, vanilla, flour, baking soda, salt and chocolate chips and you get a yummy cookie as your end result. Does it get any better than that? Use a cookie scoop to drop onto your cookie sheet, they will be very close to the same size when baked. Use a silpat mat or parchment paper lined cookie sheet. They brown beautifully on the bottom side and don’t stick at all, I’ve been using this method for years! How did our parents get along without out? In a large mixer, mix butter on medium high speed until fluffy. Add sugars and mix until smooth. Add egg and vanilla and mix until combined, next add flour, baking soda and salt. Mix on medium until combined. Add chocolate chips and stir by hand. Scoop dough with cookie scoop and drop on prepared cookie sheets, placing 1 inch apart. Bake for 12 minutes just until set and lightly browned. Let cool for 5 minutes on cookie sheet before removing to a cooling rack to cool. Let cool completely before filling with marshmallow cream. Yields 12 unfilled cookies, or 6 filled cookies. In a large mixer, mix butter and marshmallow cream on medium speed until fluffy. Add powdered sugar and vanilla on low speed until just mixed, then turn to high for another 30 seconds until creamy and fluffy. these look so good! I just pinned the recipe to try later. oh they look delish. love the filling. I’ve been laying off the sweets and sugar lately and I just wanted to reach through the screen and grab a cookie (or two). Nice work on the photos. Thanks Aubrie! I swear we don’t eat like this everyday!